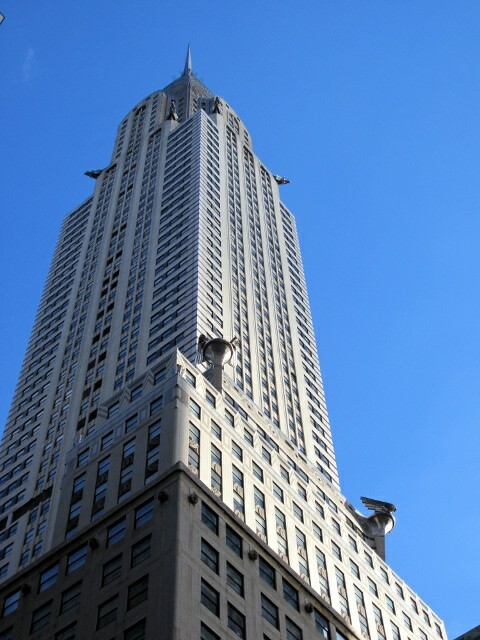 The good weather had returned over night, so we started early after breakfast to go about our sightseeing plans and went for a walk in East Midtown. 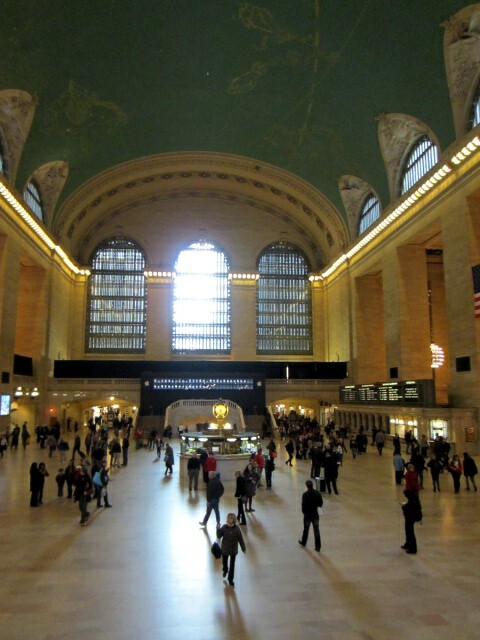 On the list was a stop-by at the famous Grand Central Terminal, which surprisingly wasn’t too crowded at the time we arrived. 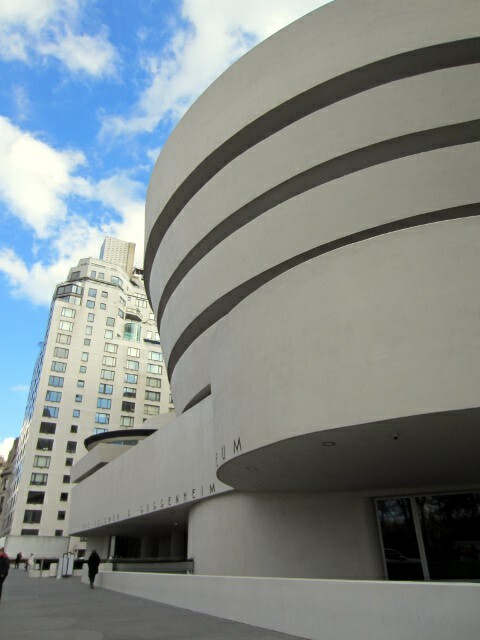 Then we went to the Guggenheim Museum, which I was really looking forward to seeing. At the entrance we bought the New York City Pass with special price vouchers for quite a few attractions we wanted to see during our stay. The overall price for all of them was less expensive than buying every single ticket at official prices. There are ways to get access to many museums cheaper, but I was happy to pay for these attractions and support cultural offerings at a fair deal, including a City Pass Visitors Fastlane at the entrances. 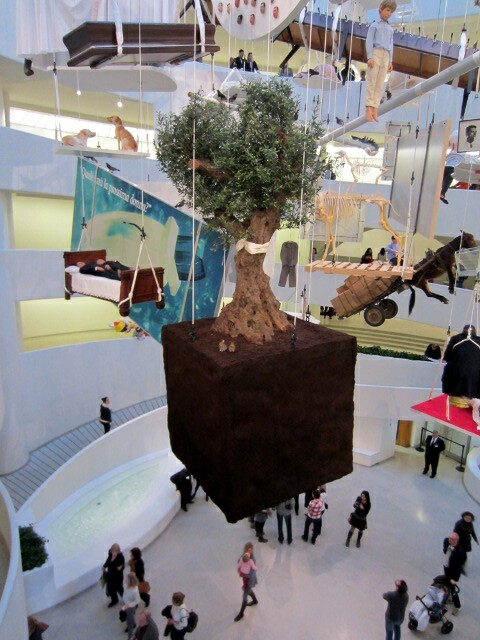 I had read about the current temporary Guggenheim exhibition of Maurizio Cattelan and was a bit worried if it would distrupt my first impression of the Museums famous architecture. 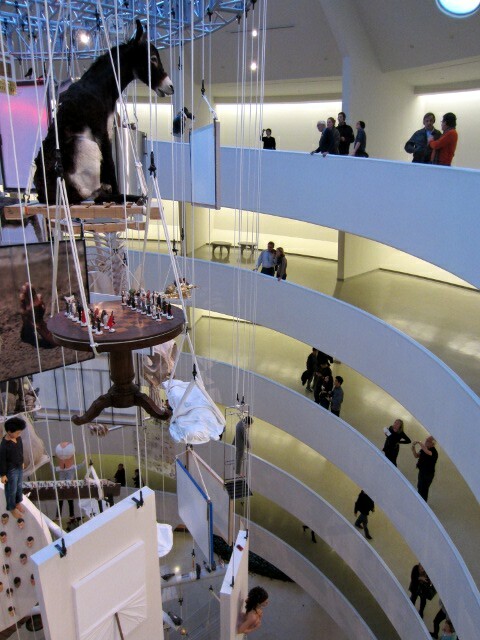 It was a huge installation with many weird exhibits hanging down from the roof inside the building at different heights. While slowly walking up the ramp, I could always discover new things making me wonder and laugh. I really liked the artists creation and I can say that I feel blessed I was there while it was shown! The next stop was planned at the American Museum of Natural History, so we went across Central Park at the shore of the Jackie Kennedy Reservoir as this museum was located almost directly on the opposite at Central Park West. We saw loads of oldschool display cabinets with padded animals and painted environment backgrounds, an underwater hall with sounds and a whale hanging down from the ceiling and of course lots of dinosaur skeletons. A perfect place to go with children for sure and one of the vouchers in our City Pass. We booked an extra show in the IMAX cinema showing a film which was really worth seeing: Crazy takes from cinematographers who filmed inside tornadoes. 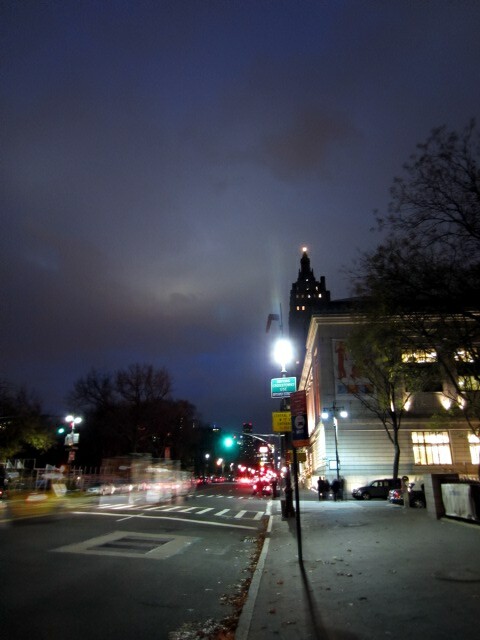 When we stepped out of the museum, it was already dark and we where hungry, so we returned to Brooklyn for dinner. Everyone who comes to New York should have Mac & Cheese at least once. 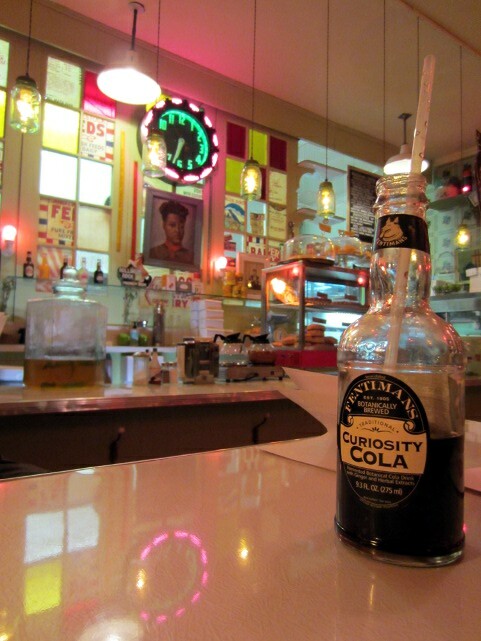 Hooray to Sadie’s Kitchen, who serve a gluten-free version. Awesome location and great food, I am loving it! 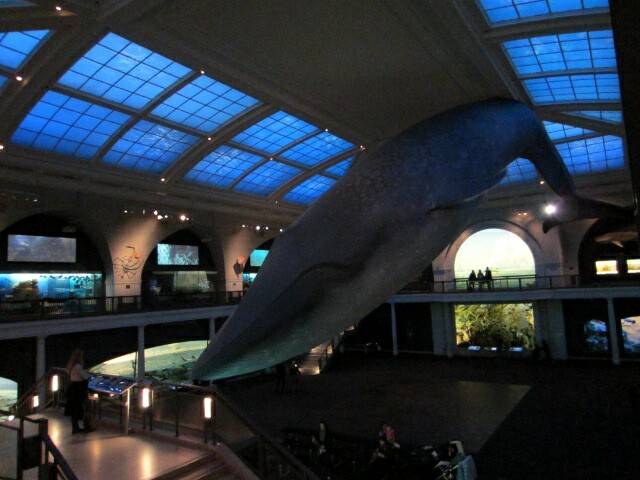 This entry was posted in Miscellaneous, Travel and tagged american museum of natural history, brooklyn, curiosity cola, gluten free, grand central, guggenheim, mac & cheese, maurizio cattelan, new york, nyc, sadie's kitchen, travel on 1. December 2011 by Chris.